You might experience a sense of deja vu while watching Mirror, Mirror, just not the kind you’d expect. This comic-fantasy version of the Snow White story lifts from both the Brothers Grimm original and the Disney animated classic. 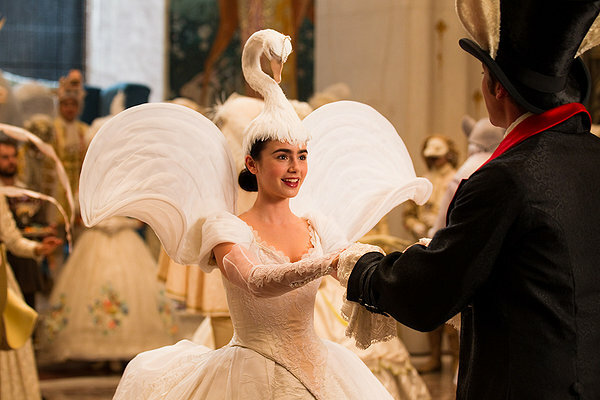 However, director Tarsem Singh and screenwriter Melisa Wallack loop in echoes of Robin Hood, Alice in Wonderland, and, for a good measure, a Bollywood-style song and dance coda. The sometimes cheeky, sometimes clunky result does little justice to the source material nor does it advance the legend. However, it makes good use of its talent (with one notable exception) and conjures a convivial concoction that, while not spellbinding, is escapist fun. As the evil Queen, Julia Roberts is far from an old hag. Her character’s ugliness is strictly subdermal, a psychotic combination of jealousy and paranoia. When she isn’t taxing her kingdom into poverty so she can host lavish parties in the hopes of wooing the rich, handsome Prince Alcott (Armie Hammer, The Social Network), she’s keeping her stepdaughter, the radiant Snow White (Lily Collins), under lock and key. When Snow White stands up for herself and becomes a rival for the Prince’s affections, the Queen’s treatment of her takes a turn towards the homicidal. The young, raven-haired beauty escapes into the woods and happens upon a hovel occupied by a septet of diminutive bandits, scallywags armed with accordion-shaped stilts to elevate them to more intimidating heights. Together, they essentially become Snow White and her Band of Seven Merry Dwarfs, robbing from the royal to give to the peasants. And, in order to save eventually herself and the kingdom, Snow White must vanquish the Queen and her own breed of Jabberwock. What’s more, when the Queen desires to commune with her titular oracle, she literally steps through the looking-glass and onto an overwater bungalow in the middle of, I dunno, Bora Bora or somewhere. While warbling the most inconsistent English accent this side of Madonna, Roberts manages to beam a blend of both beauty and wickedness. It also helps to have a comedic foil like Nathan Lane, who plays the Queen’s obsequious footman. On the other hand, a little of Hammer’s aw-shucks shtick goes a long way. The weakest link here, however, is Snow White herself, written and played by Collins as a virtual cipher. While exquisitely lovely—donning a tiara, she conspicuously resembles Audrey Hepburn—Collins simply doesn’t have the heft to navigate the nuances of a Snow White who alternates between naïve, oppressed, benevolent, idealistic, feisty and amorous. You’d expect more narrative and visual audacity from the director who once fever-dreamed The Cell and The Fall. Instead, the closest Singh comes to intrigue is a pair of giant wooden marionettes that drop from the sky to lay waste to Snow and her friends. Otherwise, Mirror Mirror is a light-hearted—and lightheaded—romp that shares one main common denominator with its Disney-produced predecessor: the dwarves steal the show.